A Chinese oil rig which operated in North Korea’s Exclusive Economic Zone (EEZ) last year was not the first to do so, satellite imagery exclusively obtained by NK Pro reveals. 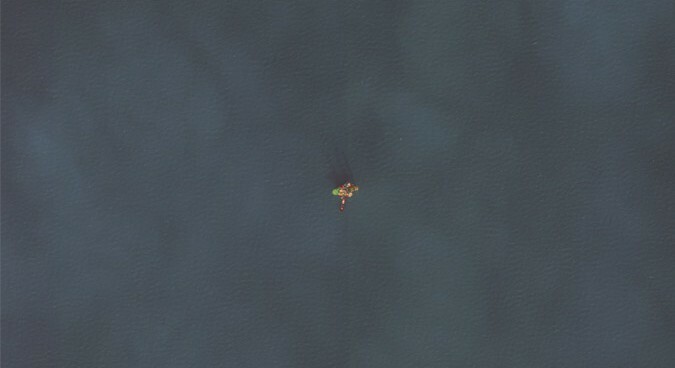 The high-resolution satellite photograph, taken in January 2015, shows another oil rig complete with a re-supply ship operating in the same area as its 2016 counterpart. NK Pro has learned that last year’s visit from a Chinese oil platform may have been the third attempt to explore and drill for oil in North Korea’s EEZ, with two earlier attempts in 2013 and 2015. The repeated visits indicate that China and North Korea have put to rest long-standing disputes over maritime borders and that Beijing may be committing to developing commercial oil flows in the area. In October last year, NK Pro reported the presence of a Chinese oil rig in the DPRK’s EEZ. Owned by the state-run National Petroleum Corporation (CNPC), the Zhong You Hai 17 arrived at its location 120 km west of Nampho port in late May, where it remained for nearly six months. The Zhong You Hai 17’s position was captured by vessel tracking site Marine Traffic, which also later showed the oil platform leaving the area shortly after the publication of NK Pro‘s story. The rig’s presence in the North’s economic zone was the first public evidence that Beijing was showing renewed interest in a memorandum of understating (MoU) signed in 2005 to develop the North’s oil reserves in the area. NK Pro satellite imagery indicates that China’s interest in reviving the MoU could date back to at least 2015, and there remains the possibility of an earlier 2013 attempt. Read more on NK Pro here. Subscribe to read the remaining 280 words of this article.